I love the book of Proverbs. It is probably the clearest book in the entire Bible in regards to understanding. It comes right out and tells you how you should and shouldn’t act, what you should and shouldn’t do. There is so much wisdom in there, but I’ve not heard many pastors preach about it on Sunday mornings. I’ve been thinking about doing a little series of posts that go through Proverbs and pull out items that catch my eye and expand on them for quite some time. As I was coming up with topics for a new post, I felt it was time to start that series. 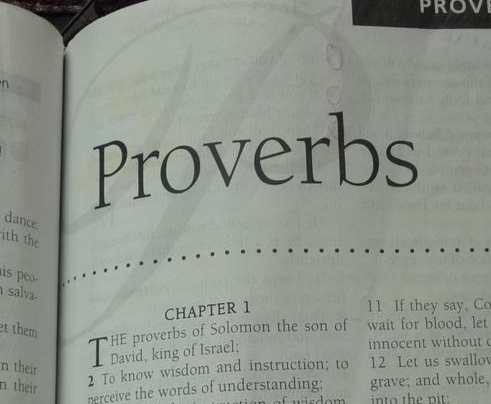 Right from the start, we learn what the purpose of the book of Proverbs is. It couldn’t get much clearer than that. So what can we expect to learn through these proverbs? So we know the purpose and what we will learn, but who are they meant for? So they are basically for everyone. Solomon did not leave anyone out of those who can benefit from these proverbs (or by extension, the wisdom in all of the Bible.) So that includes all of us! So why? Why do we need this wisdom, why do we need to dive deeper? Well there you go. We learn these things because the Lord wants us. The fear of God, sounds like an awful thing. But it’s not, it’s a deep sign of love and respect and willingness (in fact deep need) to obey. I’m actually looking forward to this as I know I will learn a ton from a deeper dive into the Proverbs. Stay tuned!